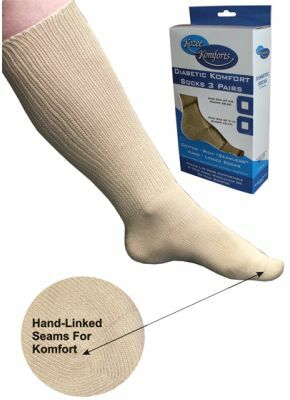 Komfort Diabetic Socks 3 Pack For Sensitive Feet. Diabetic socks help keep circulation flowing as it should. Irregularities of blood circulation and nerve damage caused by diabetes means that keeping your feet healthy is extremely important, and these specially designed socks for diabetics are intended to do just that. Komfort diabetic socks are designed to provide maximum comfort and protection for those with delicate and sensitive feet due to diabetes or arthritis. The seams are hand-linked giving a sympathetic and as non-irritating a seam as possible, reducing friction injury caused by more "traditional” seams. These socks extend to the knee with a gentle and generous stretch to provide mild support whilst allowing healthy air circulation. 75% cotton, 15% spandex, 10% amorphous polymers, with naturally occurring anti-bacterial properties. They are available in a choice of Beige or Black. Ideal for my dad who has swollen ankles. Very pleased. Very good product and prompt service thank you. Very pleased with the Diabetic Socks which are very comfortable to wear and offer good support. Impressed with the speed with which my order was handled. Perfect socks for varicose veins because the weave finishes straight up at the tops rather than the tight and painful rubberband-like effect with other types. Very pleased! 1st class service, item as described always buy from this company. Again, I can highly recommend these super socks - particularly if you have large calves. They are so comfortable for varicose veins. I prefer the black and the grey. The beige colour is more a khaki greenish-beige. The shoes I have just bought from you are just perfect in fit. very roomy as stated. The first pair of shoes I have purchased in a long time that did not need a shoe horn to enable me to get my foot in. They are very comfortable and of good quality as well. Thankyou for asking.